According to the classification, there are conical tire type mobile crushing station, counter-type tire moving crushing station, jaw type tire moving crushing station, impact type tire moving crushing station, etc. Users can choose the type of processing raw materials, scale and finished materials. The requirements vary in a variety of configurations. 1) Mobile crushing stations are widely used in the recycling of mines, coal mines, garbage and construction waste, earth and stone works, urban infrastructure, roads or construction sites. 2) Treatment of topsoil and other materials; separation of viscous concrete aggregates; construction and blasting industry; screening after crushing; quarrying industry. 3) Manual crushing of river pebbles, rocks (limestone, granite, basalt, diabase, andesite, etc. ), ore tailings, and stone chips. The tire type mobile crushing station can be divided into four series - cone broken tire type mobile crushing station, E broken tire type mobile crushing station, counter-breaking tire type mobile crushing station, screening track moving crushing station. 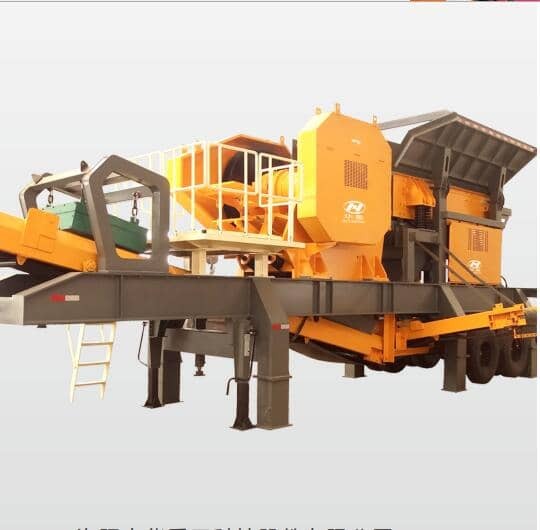 The main features of the tire-type mobile crushing station are: economical and practical, suitable for small and medium-sized customers, multi-integrated automatic coarse and fine secondary crushing, self-loading including conveying screening, and full Raiders independent crushing treatment pioneer. Performance characteristics: reliable and convenient maintenance: tire-type medium-cone moving crushing station, equipped with high-performance cone crusher, high crushing efficiency, versatility, excellent crushing product quality, light and reasonable structural design, excellent crushing performance. Reliable and stable quality assurance, the largest range of coarse, medium and fine material crushing and screening requirements, for the majority of Chinese and foreign new and old customers have established a good reputation. Previous Article：How to enhance the Working Efficiency of Sand and Stone Production Line?